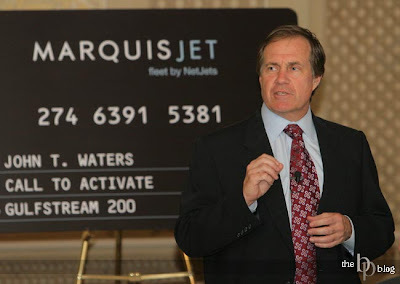 Yesterday, I had the wonderful privledge of photographing a reception for Marquis Jet at Boston's Four Seasons Hotel. The guest speaker was 3 time Super Bowl Champion coach Bill Belichick. Bill came across as a humble and fierce nice guy, and while he was speaking, you could not help but pick up on his extraordinary high level of intelligence. Especially when it comes to football, but that goes without saying. 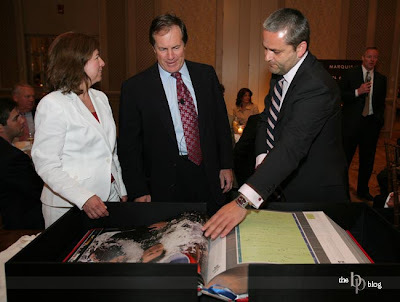 After his speech to a room filled to capacity with private jet owners, Bill was presented a copy of the "Super Bowl XL Opus". This book which measures almost 2 feet square, and nearly 90lbs., was autographed by all 40 of the Super Bowl MVP's. I am told the hand-stitched and bound book has a price tag of approx. $40,000. The book contains a history of the first 40 Super Bowls in words and pictures. I have never seen anything quite like this book...it puts the word gargantuan to shame!